BANGI, 3 April 2014 – Even though The National University of Malaysia (UKM) had provided 4000 membership for a web-based service to detect plagiarism called Turnitinonly 500 licenses have been used by its academics. 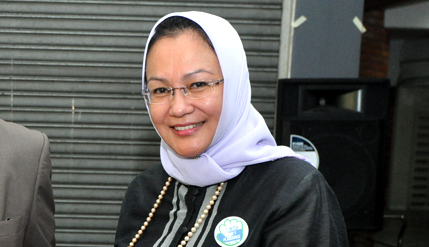 Dean of Faculty of Social Sciences and Humanities (FSSK), Professor Dr Hazita Azman said even her faculty had only 76 active users from among the 161 applications for Turnitin. Speaking at the Plagiarism Awareness Campaign launching ceremony here last Thursday she said Turnitin is a website which requires a membership license that can be used as a tool to detect plagiarism in essays. It enables academics and students to see the resemblances between their own works to the original texts and for the supervisors to trace the original sources of the students’ works. She raised the matter in an effort to inform academics and students through the campaign that there are already services available to detect plagiarism and the Turnitin service is one of them. Prof Hazita encouraged the supervisors to make use of the readily available tool provided by the university. Plagiarism, she said, is an issue that will always crop up in the academic world due to the different context, academic traditions and culture on plagiarism by the academics. Hence, through the campaign the faculty is serious in overcoming the breaches and is dedicated in opposing plagiarism as such activities was suspected to be on the increase among students. The campaign, with the slogan ‘Be Wise, Don’t Plagiarise’ was sponsored by the Centre for Research and Innovation (CRIM) and launched by Deputy Vice-Chancellor (Academic and International Affairs) Prof Ir Dr Riza Atiq Abdullah OK Rahmat. Chairman of the Plagiarism Awareness Campaign Dr. Jamaluddin Aziz and his committee members welcome request for training on how to use Turnitin and the skills needed to detect and avoid plagiarism.